High resistance silver brazing alloys. Some silver brazing alloys are ATG approved. These brazing alloys are often used with powder, paste and gel fluxes. Depending on the application, they are offered as bare or coated rods, bare or cored wires, laminates, tapes and preforms. These products are mainly used in construction and mechanical and electrical assemblies. For brazing alloys in cream form, please refer to the specific datasheet. Waste originating from the use of these products can be recycled. Contact our recycling department to find out more. This table shows the most commonly used alloys. 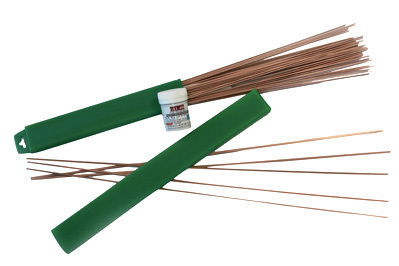 (*) ATG approved with AGFLUX flux (approval no.1530) for the capillary brazing of copper pipes designed for use in combustible gas installations. (*) ATG approved with AGFLUX flux (approval no.1585) for the capillary brazing of copper pipes designed for combustible gas installations. Have you defined the type of application? Contact us our staff will be happy to assist you in deciding which alloy to choose. Phosphorous acts as a flux on the copper. No need for an external flux. For copper alloys, you need to use an external flux. Requires an external flux. This brazing alloy is runnier thanks to the presence of silver which also preserves the mechanical characteristics at low temperatures. Ternary alloys used in the manufacture and repair of electric motors and gas water heaters in the refrigeration sector. For this application, it is advisable to use a solder with a 50% silver content. Steel, brass, bronze, nickel and copper alloys. All ferrous and non-ferrous metals, except for aluminium and magnesium. Requires an external flux. Thanks to its high silver content which preserves the mechanical characteristics, this type of brazing alloy is runnier and has a lower melting temperature. Alloys developed to replace alloys containing cadmium. Used in particular in the food or health sectors but also in mechanical and electrical assemblies. Flux-cored silver solder for brazing. Tubular wire with 1% of integrated flux, perfectly controlled and constant. Non-corrosive flux, no cleaning required. Improvement to work quality. Significantly improved watertightness test. Automotive industry, aeronautics, electrical and domestic equipment, copper or steel pipes, eyewear, jewellery. The product safety datasheet below is available upon request from the METACONCEPT Group. Before brazing, it is imperative that any layers of oxides are removed along with any impurities such as traces of rust, scale and verdigris. This procedure may be carried out mechanically (wire brush, sandpaper, grinder, file, etc.) or chemically. Thick layers of grease or oil should be wiped off or removed using solvents (e.g. acetone) for sensitive parts. To keep the parts being assembled in the correct position until the filler metal solidifies, they should be fixed ensuring that there is a narrow soldering gap between them of between 0.05 and 0.2 mm. If the flux is contained within the coating or if the filler metal is auto-fluxing, you can proceed directly to the brazing stage described below. Otherwise, apply an external flux. So that the filler metal can fill the gap, the parts being assembled must be heated to the working temperature of the filler metal (around 20 to 30° above the liquidus temperature). As soon as the flux has been applied evenly and the temperature of the filler metal has been reached, apply the latter to the soldering gap. The filler metal permeates the space between the two parts being assembled via capillary action. Leave the parts to cool in their holding brace until the alloy solidifies. The part can then be removed from its support. To avoid corrosion, flux residues must be removed after brazing using a wire brush or a piece of sandpaper. The brazing alloy provides a highly durable assembly of parts made of copper, copper alloys or steel. As the fusion temperatures are in excess of 600°, you must use a very powerful heat source such as an oxy acetylene torch for example.